Pulled the trigger on some 17x9 et35 Tc105N's after contemplating for a year. I wanted something lighter then stock and good looking. Couldn't be happier. On my scale they weighed 16lbs . I bought some continental extreme DW 255-40-17 tires (23lbs) because I wanted something lightweight and good handling. The tires/rims weighed 38.6lb on my scale . 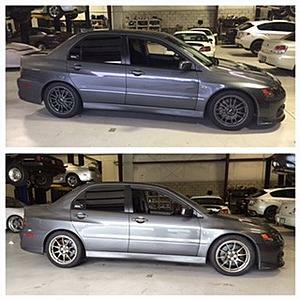 My evo 9 BBS with bald 235-45-17 RS-3's weighed 40lbs on that scale as a comparison . These rims will require at least a 3mm spacer to clear the front brakes. I'm running stock studs and there is plenty of thread with a 3mm spacer. If I was going to track these wheels I would get a hubcentric spacer made for piece of mind. The car drives nicer with new tires and seems to accelerate easier then before. I attribute that to the difference in size and weight . I went from a 25.3" to a 25". 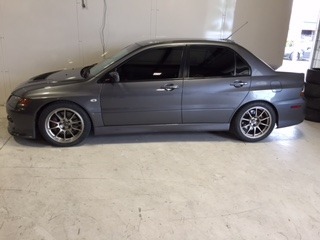 I have a 4.11 gear so anything smaller helps . Last edited by Abacus; Mar 26, 2015 at 05:15 PM. Lots in his build thread. best vendor to pick these up from? I would say whoever has the best price. I think STM can get them, Evasive Motorsports RavSpec, TF Works. STM is a site sponsor though. I would get the +35. Its a good fitment on the car. +2. Itll tuck em much better in the rear and Id bet the +25 has a "ricey" lip as you put it relative to the higher offset variants. But whats up with the stated 3mm spacer needed up front? Im kinda surprised to hear that but guess a lot is dependent on spoke design in conjunction with offset. well price difference for +25 is about $100, and that's only cuz the +35s are on sale. I'm really leaning toward +25s here, if not ce28sl's lol. 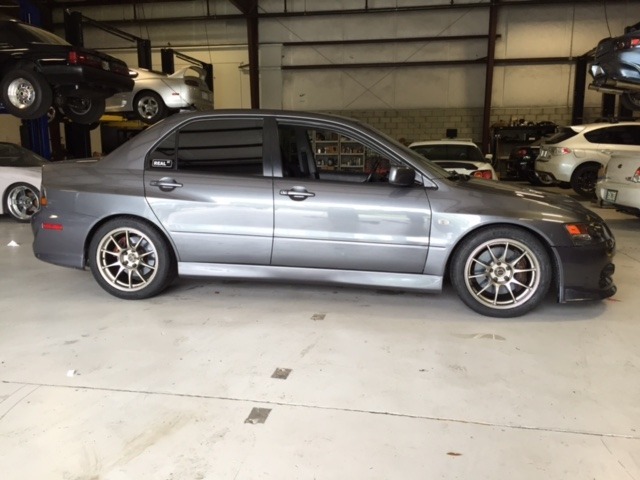 I'm rolling the fenders, rears at least so I can fit the +25s, so I have to imagine i'll be fine with rear fitment on these. I'll be running the 255/40-17 re71rs, but re71rs don't really run that wide, or tall. can we confirm the +35s NEED a spacer to clear the brembos? yeah... a 3mm. You can run that on the stock studs..
No, you can't do that. The wheels has the same thickness from the lug nut taper to the mounting surface, regardless of offset. If you shave the wheel down, you run the risk of the lug nuts pulling through the wheel. to use since the bore on these wheels is 73mm?